Glitter & Duck Tape Presents: Our Favorites! 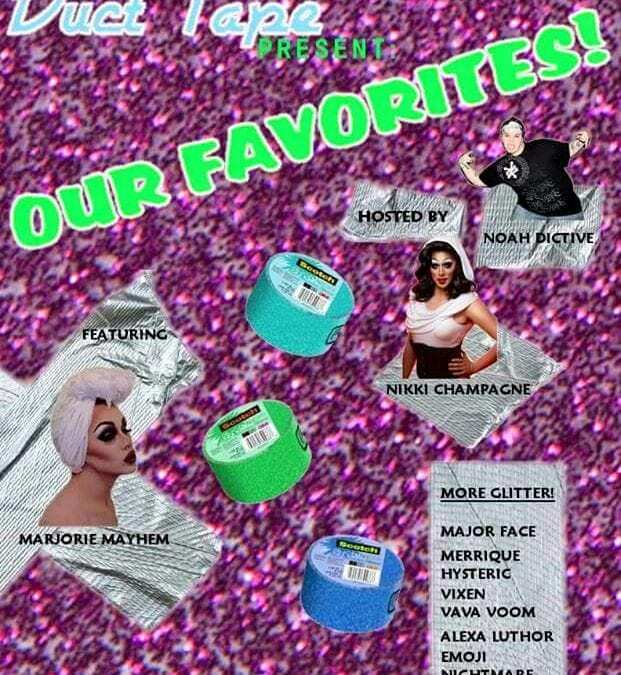 Glitter & Duct Tape is hosting its first show!!!!!! They are going to bring some of their best to the stage to showcase their favorite numbers for YOU. Nikki Champagne, Major Face, VixenVava Voom, Merrique Hysteric,Alexa Luthor, Emoji Nightmare, and more will be gracing us with all the beauty, brains, flash, and sass you can handle!!! This just in Emoji Nightmare( Justin Marsh) will also be making an appearance! You DO NOT wanna miss this show! This month we are featuring the one and only, Miss Marjorie Mayhem, and Papi Javi will be laying down the music to spice up our evening. Also, as a special for you all, we have the newly crowned VT Drag Idol 2015, Miss Farrah Foxx joining us! The Monkey Hous doors will open at 9, show at 10! !